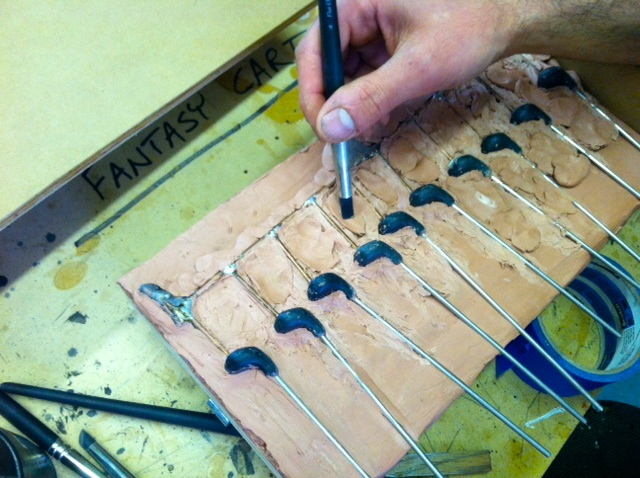 One of the biggest challenges with the new Mulligan golf trophy has been how to sculpt, cast, and attach the club. Most golf trophies you see have the golf club running down the back of the figure with it ultimately being attached to the backside of a leg. I really didn’t want to go this route and instead wanted a look and feel that was authentic and true to a golf swing. The challenge though would be that the club head would stick out away from the body and be susceptible to breaking. This dilemma would never fully be resolved because that point of the golf trophy will always be it’s weakest point. However, one way to help prevent the rod from snapping is to make the golf club out of 1/8″ fiberglass rod. This way it will allow some flex in the rod if it happens to be hit or bumped. Hopefully this small detail will prevent a number of unwanted breakages from happening. One thing I’ve come to realize is that no matter what you do, breakages will always happen.